Shillong girl Phoebe Dale Nongrum, 30 has been selected to be a part of the Formula LGB 4 circuit. She is now a part of the first-ever Formula LGB 4 women’s team. She has been inducted in the the Ahura racing, a professional racing team. Ahura racing, formed in 2017, is owned by Sarosh Hataria, a successful hand at the Formula LGB 4 circuit. He had held a talent hunt for women drivers for the Formula LGB 4 team selection. She had to compete with 60 women to make it to the Formula LGB 4 team. Eleven other girls have also been selected for the team. The selection was done on the fastest lap timing of the drivers and she clocked a timing of 1.23 that’s 1min 23sec on a 2km track. The team of twelve girls will take part in the four seasons of racing this year against the men. Being the lone woman from Meghalaya and the region to be part of a Formula LGB 4 team, the journey hasn’t been an easy one. Brimming with confidence, Phoebe wants to turn racing into her career. But she knows the journey won’t be easy as the logistical costs are prohibitive. Racing is an expensive sport and without sponsorships its difficult for individuals to continue it, reports The Telegraph. She now has to undergo further training at Coimbatore from August to fine tune her skills as she is still new to circuit racing. 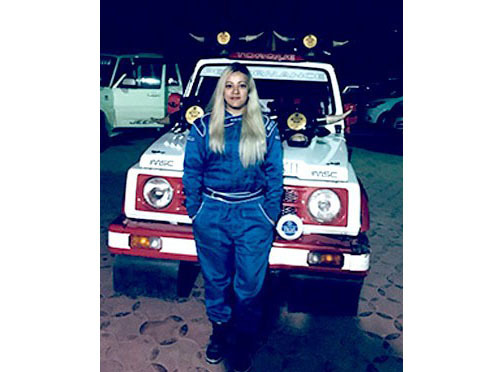 Her passion for wheels has led her to become a professional racing driver.